Water is gold in this area. With increasing population all over the country and especially here in California, water is a precious commodity. If you're closer to a town, you may have city water, but very often you'll be using well water. How much that well produces, how large of a pump you have, and the size of your storage tank all play a roll in how much you can irrigate. If you've lived in a more moderate climate, turning sprinklers on and leaving them might have been all you need. In this area, sprinklers are not recommended except for a few shallow plants like grass, flowers and shallow rooted shrubs. 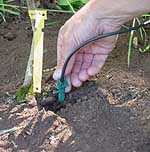 Trees need deep watering which sprinklers don't provide well. Plus, they water indiscriminately within an area. That means you're making the weeds grow more there as well as the plants you want. And some plants, like the trees, simply don't get enough or the right type of watering. Drip systems allow you to water only what you want. You can put drippers in a row of trees and deep water (a couple of hours) a couple of times a week, or you can put drip systems into hanging or standing pots and automatically water ten minutes twice a day in the hot part of the summer. Unless you never leave home and are really good about remembering to turn things on and off, automatic timers are recommended. While big retailers have some things at great prices, we've found their drip lines inferior. They usually supply a solid black line and it doesn't stay connected nearly as well. When a valve comes on the line blows off and your plants don't get watered and your valve area gets flooded. Go to a professional sprinkler supplier and buy the real thing from them. The cost is very low and the quality is better. As an example, I bought 500' of blue line, three rolls of drip line and a punch all for $42 just last week. Rainbird® irrigation for large areas is really pretty easy. You can buy individual Rainbird® sprinklers that terminate a line, or you can buy inline Rainbird® sprinklers that can be capped to terminate a line or used in line with 2-4 sprinklers operating on the same line at the same time... IF you have the water pressure to do so. We can only operate two systems at a time, and after a 5 year drought (which does happen from time to time) we could only operate one at a time. Never install a system uphill from your valves unless you don't mind constant leaking. When an uphill system is off, all the water, once under pressure, in the lines will drain back down to the backflow valve and keep things soaked. If you can't avoid it, put a big dish there and call it a critter drinking bucket. Our cats find it whether we put a container there or not. They have their own little watering hole with a constant supply of fresh water. Ladies, if you'll be installing or maintaining your drip system, I've found that it's easier to use 1/8 inch connectors. They go together much easier than the 1/4 inch. It'd be nice if once installed everything would just work right all the time. But, cleaning the systems all the way down to the individual drippers is essential, especially if you're on well water. 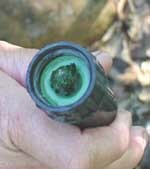 Well water tends to carry a little bit of sediment so screens should be inserted between your valve and your drip line. Step 1. Screens should be checked frequently and cleaned out. Step 4. Remove (you'll need pliers for this) the connector from the drip line.. blow through it to clear any clogs and, if water is flowing out the hole from the blue line, reinsert. If water is not flowing well, check the hole itself. I've pulled out what seems to be miles of goop (that's a technical term) from the hole itself. And, at times, I've had to repeat this process two or three times in a row to make it work right. Note that the connectors are somewhat fragile and can break fairly easily, so carry a supply of new ones with you. Cleaning valves on automatic timers is also important. While they sit idle in the winter, spiders build webs inside or other bugs might find it a nice winter condo. If they get caught in a valve, you'll have a malfunction. Also, early spring with the warm sun, algae grows rapidly. The valves must be taken apart in several places to clean and clear, and the process may have to be repeated several times during the watering season. Check drippers every week or two. It doesn't take long in the heat of summer for plants to get crispy here. If you see one wilting, check the line immediately. I generally put on my tool belt, stock it with drip system parts, and wander each line about once a week. The cats or other animals can break parts occasionally. And every now and then the big two legged animal gets carried away with the weed wacker and doesn't realize he's eaten some of my drip lines as well. Last but not least, remember to turn your systems off in winter and thoroughly check them the following spring, refreshing batteries in battery operated timers and cleaning all the parts along the way.